Blade material: Galvanized Steel, G.I. Airotech Make Circular Inline Fan specially design of metal housing, together with high efficient motorized impeller make the inline duct fan superior to others at the aspects of bulk, weight, vibration, noise, durability, efficiency and safety. It’s widely used at Toilet, hotel, auditorium, station, supermarket, airport and other public occasions. 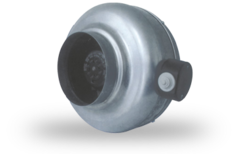 Circular Inline Fan represented by us are designed for optimum efficiency and low noise. 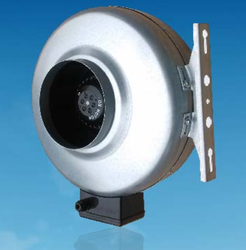 The Circular Inline Fan are moisture resistant and motors are rated IP44 .The casing is manufactured from pre-galvanized steel. The fans are compant and very easy to install. Circular Inline Fan with or without casing. - ABS Backward Curve wheel. Jay & Co. India Pvt. Ltd.